Monthly day-night system, 24-hour care to maintain the acid-base balance of the body. Nutricode Inner Balance is a rich set of complementary active ingredients. It has been based on Rosa Centifolia flower extract, which supports physiological processes of metabolic waste products elimination and helps to maintain the acid-base balance. Zinc favourably affects the functioning of the immune system and protects cells from oxidative stress and along with calcium, it helps to maintain healthy bones. Calcium is also responsible for normal energy metabolism and helps in the proper function of digestive enzymes. Magnesium and iron affect the reduction of tiredness and fatigue, whereas potassium and copper support the proper functioning of the nervous system. Nettle herb extract supports elimination of water from the body. A source of phenylalanine. Directions: Dissolve the sachet content in 200 ml of water. Take 1 sachet 2 times a day. Do not exceed recommended servings for consumption during the day. The product is intended for 13 years plus. Night capsules, which contain lemon balm extract and hops, facilitate falling asleep and by providing the proper sleep they contribute to further de-acidification of the body. Directions: It is recommended to take 2 capsules a night. Follow with drinking plenty of water (at least 1 glass). Do not exceed recommended servings for consumption during the day. 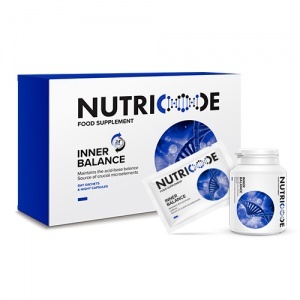 NUTRICODE INNER BALANCE night capsules 2 capsules contain: Magnesium 15 mg (4%)* Zinc 5 mg (50%)* Lemon balm extract 400 mg Ground hops 100 mg.
Nutricode Sachets Ingredients: calcium citrate, bulking agent: sorbitols, sodium citrate, magnesium citrate, potassium citrate, nettle herb extract, rosa centifolia flower extract, iron (II) gluconate, aroma, zinc citrate, sweetening agents: aspartame and acesulfame K, copper (II) sulphate, dye: riboflavins. Contains sweetening agents. Nutricode Tablets Ingredients: lemon balm extract, ingredient of the capsule: gelatin, bulking agent: calcium citrate, ground hops, magnesium citrate, zinc citrate, anti-caking agent: magnesium salts of fatty acids, colourant: E171.